On the 3rd of March, Berta Cáceres, a prominent Honduran-Lenca feminist and Indigenous rights defender was assassinated in her home by unidentified assailants. A Lenca Indigenous woman, Berta worked indefatigably to advocate for the rights of the Lenca people. Her compassion and commitment led her to cofound the Civic Council of Indigenous and Popular Organizations (COPINH) in Honduras in 1993. For twenty-three years she led environmental and land rights campaigns against megaprojects, most recently against the controversial Agua Zarca hydroelectric project for which she won the prestigious Goldman Environmental Prize in 2015. Berta was also a mother of four. In May 2013, Urgent Action Fund-Latin America supported COPINH twice with a security and protection grant (a collective form of protection, secure communication and mobilization), and more recently with an advocacy grant to demand the end of Berta’s criminalization. With the support of UAF-LA and international pressure and solidarity, Berta was released from persecution. In August 2015, UAF-LA held the Regional Convening on Defenders of Life against Extractivism as a strategic space for organising, exchanging tactics, building capacity and solidarity. Berta was in attendance and stated that women human rights defenders (WHRD) challenging extractivism are in essence challenging the dictatorship of big capital, coupled with a patriarchal culture that positions the female body as a contested site of struggle. Women human rights defenders become the main victims of persecution, threats, harassment and sexual harassment, as an expression of a misogynist cultural pattern. The assassination of such a vocal and passionate WHRD with a clear grasp of the complex issues at play in the challenge against extractivism and for Indigenous people’s rights is, tragically, not an anomaly. Berta had received countless threats against her life and was granted precautionary measures by the Inter-American Commission for Human Rights. According to a study by Global Witness, at least 116 environmental activists were killed in retaliation for their activism in 2014 alone. A stunning 40% of those killed were Indigenous people. Last October at the 156th regular session of the Inter-American Human Rights Commission, Urgent Action Fund - Latin America joined with the Mesoamerican Initiative of Women Human Rights Defenders and others to register its profound concern over the high number of women who have been attacked in Latin America over environmental conflicts. These include the assassinations of Edith Santos, who organized oil workers in 2014 in Colombia; the killing of the environmentalist Fabiola Osorio in 2012 in Mexico; the death of Kimberley Blackwell, a Canadian environmentalist working in Costa Rica in 2012; of María Margarita Chub Ché, who was murdered in 2011 in Guatemala in front of her two small children; of Dora Alicia Recinos, who was shot and killed in 2010 while pregnant for her work on an anti-mining campaign in Honduras; and of too many others. UAF - Latin America and its sister organizations in the region called on the Inter-American Commission to take immediate steps to recognize and to improve the security of women activists who defend the environment. The testimonies brought forward during the session documented how destructive mining projects, among other extractive industries, are threatening both environmental health and the stability and wellbeing of local communities. As communities have organized to protect natural resources and their rights to their land, they have found themselves in the line of fire. 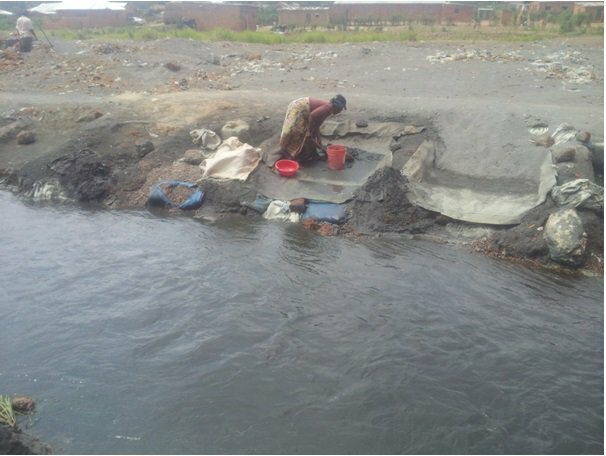 Monitoring water pollution in the mining region of Lubumbashi, DRC. Photo: Observatoire d’études et d’appui à la responsabilité sociale et environnementale. The trend of violence against environmental activists is also significant across Africa, where women environmental activists are facing a plethora of well-documented direct violations in their work, including threats of murder, kidnapping, threats to their families; forced disappearances; imprisonment; sexual violence; and defamation or spurious lawsuits. Yet women continue to be at the forefront of environmental campaigns. With UAF - Africa support, in the Niger Delta women are deeply engaged in campaigns against the Shell oil company; in the Democratic Republic of Congo women environmentalists are collecting and monitoring data on water pollution caused by mining; and in Tanzania, women leaders in Mtwara are opposinge construction of a mega-gas pipeline that would run through their community. These stories continue to resonate around the globe. In 2015, UAF convened women who are on the frontlines of environmental work in the Philippines and Indonesia and facing great personal risk in their activism. They came together to share their struggles, their strategies and their achievements, drawing strength from one another. One of the women was Eva Bande, a resilient Indonesian activist who was jailed for four years for protesting against the logging of native trees from her community’s land and the establishment of palm oil plantations that resulted in the loss of livelihoods for local farmers, as well as property damage. Eva was ultimately granted clemency by the President of Indonesia, but during her imprisonment, her three small children and husband suffered in her absence. UAF provided funds to relocate them closer to her prison which was 14 hours away, and supported the successful campaign for Eva’s release. Eva and her Indonesian colleagues were joined at the convening by activists from the Philippines, including Wilma Tero Mangilay who is an activist protesting illegal logging operations. As an Indigenous woman, Wilma educated herself on the rights and protections accorded to Indigenous peoples and joined a local Indigenous rights organization. She became more visible at the frontlines of protests, and like Eva, she was targeted for her activism. Two defamation cases were brought against her in a legal battle she could ill afford. She many days in court, and ultimately brought her own lawsuits against the mining companies, as well. Her activism paid off and she was successful in stopping their work. At the convening, women exchanged tactics and strategies and were given training in techniques of self-care to help them continue their activism in a sustainable way. We call on the Netherlands Development Finance Company to immediately withdraw its financing from the Agua Zarca project, the project that was opposed by Berta Cáceres and her community. The Netherlands, which has invested in women’s rights and in environmental initiatives for many years, should, at minimum, want no association with a venture tainted by an assassination charge. Additionally, the Agua Zarca project was initiated in violation of ILO Convention 169, without prior consultation or consent of the affected communities. We call for truth and justice. We join many organizations and governments in calling on the Honduras government to undertake a prompt, thorough, and fair investigation into Berta Cáceres’ murder and to hold those responsible accountable. We call on all member states participating in the 60th United Nations Commission on the Status of Women to take steps to affirm the right of citizens to engage in peaceful campaigns to protect the environment and to protect activists from violations of their human rights. We ask them to specifically consider the experiences of women who defend human rights and the environment, and to take concrete steps to address the additional risks they face. Her violent death is a painful reminder of the powerful trinity of corporate, government and military interests, creating a tapestry of capitalist power structures that makes for a very challenging, often deadly, struggle. To quote the eloquent statement released by Berta’s mother and children, “Berta’s struggle was not only for the environment, it was for system change, in opposition to capitalism, racism and patriarchy." Berta will live on in our hearts, minds, and actions! May her soul rest in peace and power. 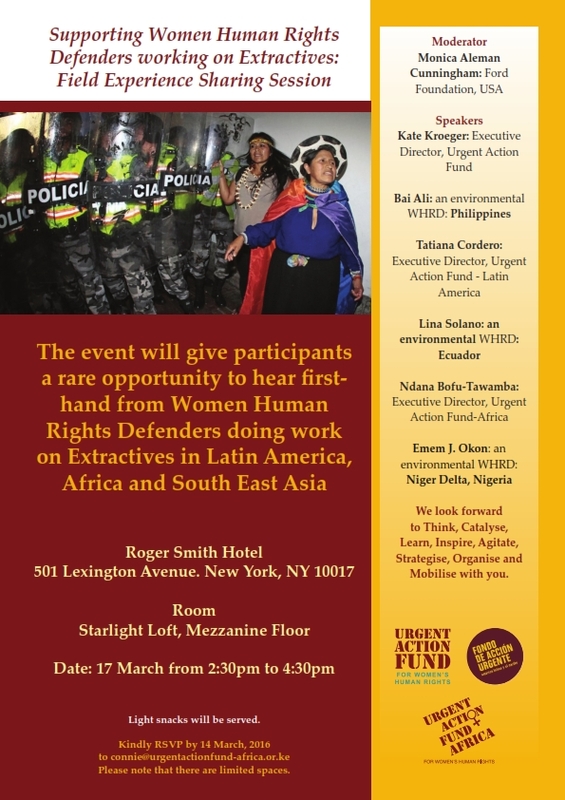 On 17 March the UAF will host a session at the UN CSW : Supporting Women Human Rights Defenders Working on Extractives: Experiences from the Grassroots.